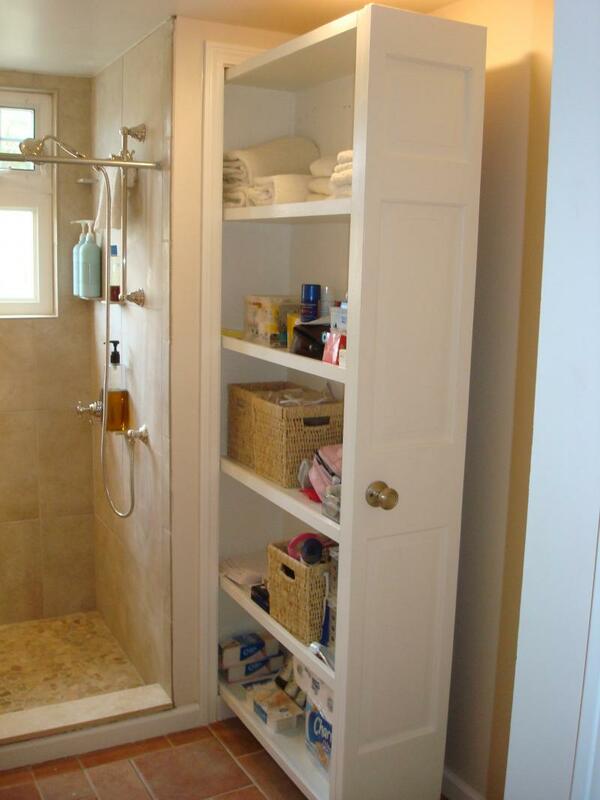 Every bathroom needs storage solutions and this is especially true if you have a large household. Between everyone’s skincare products, toothbrushes, toothpaste, hair care products, towels, brushes and other necessities of life, everyone needs somewhere to put it all. That doesn’t mean it has to look ugly, however. With a little bit of creativity, strategic positioning and the right materials, you can transform your bathroomfrom messy and unkempt to stylish and organized in no time. Just check out these simple ideas we threw together. 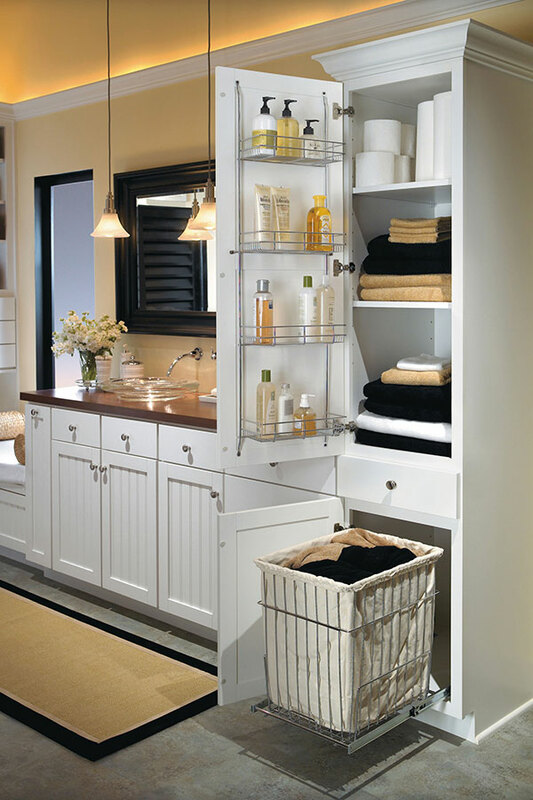 Below are 30 chic bathroom storage ideas to keep your bathroom organized and looking great. 2. 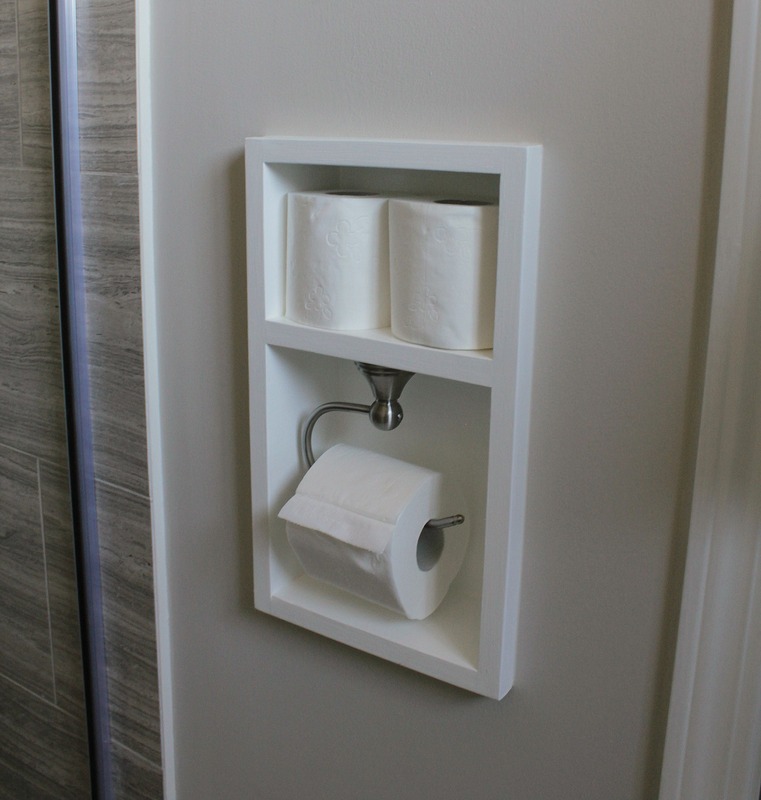 A Shadow Box for Toilet Paper? 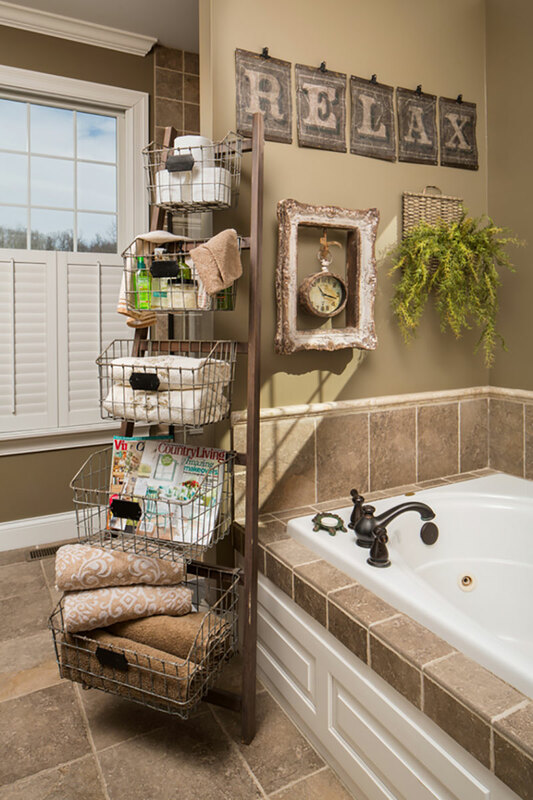 Just about anything can become a storage solution for your bathroom with a little imagination. Tiered containers and shelving, compartmentalized drawers and hanging baskets have completely transformed this bathroom cabinet. Under ordinary circumstances, it’s easy to imagine how this would be complete chaos. 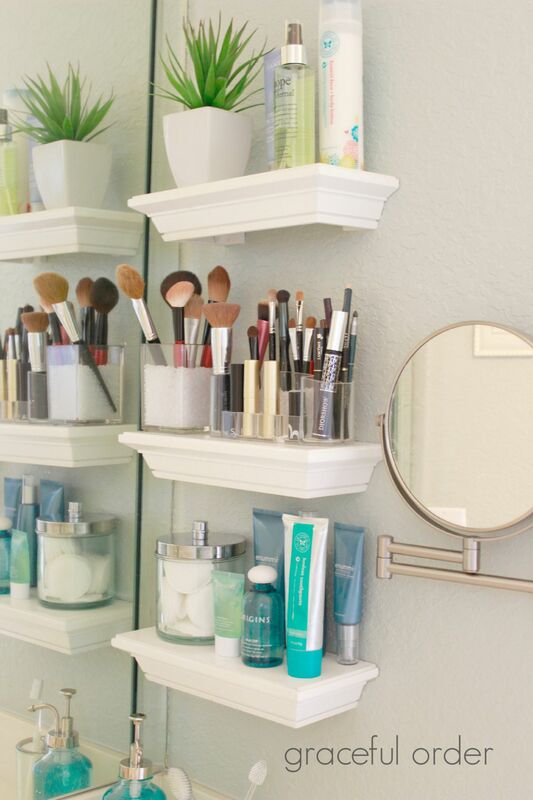 Just because something isn’t on display in your bathroom doesn’t mean you shouldn’t try to organize it. 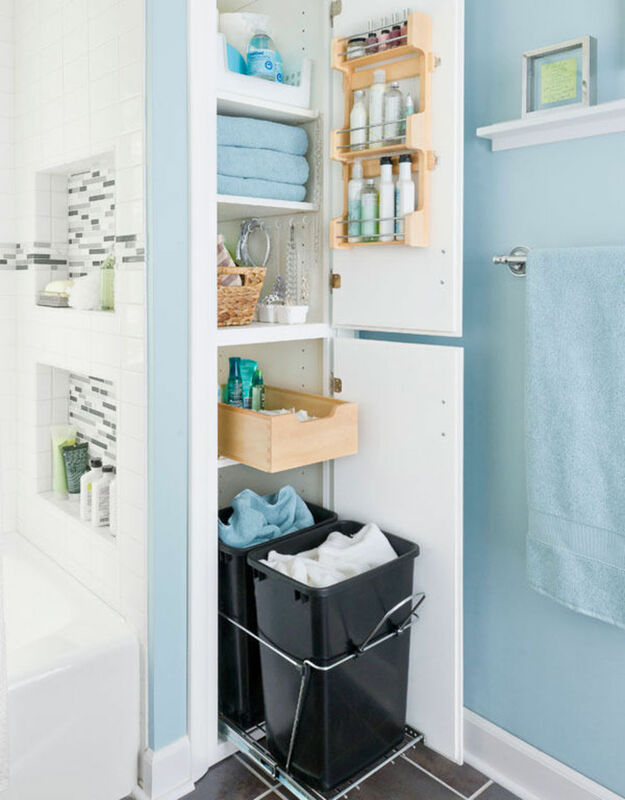 This one example shows how a combination of several bathroom storage ideas can culminate into the perfect solution for storing just about anything in your bathroom neatly. It even manages to look quite nice, despite being out of sight otherwise. 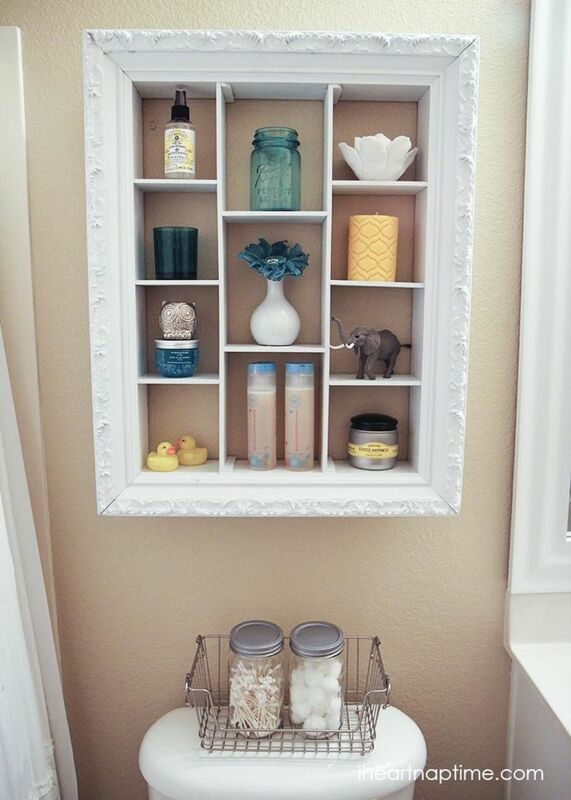 If you don’t like medicine cabinets, you will love this bathroom storage hack. It’s devilishly simple, too; just get some small floating shelves and install them on the wall by your main bathroom mirror instead of having a medicine cabinet. Mission accomplished! You don’t have to use them for the contents of your medicine cabinet if you don’t want to, either; you can put small plants, bottles and other knickknacks on the shelves as well with the same effect. You may wish to group what you put on your shelves by color, shape or another similarity for the best effect. 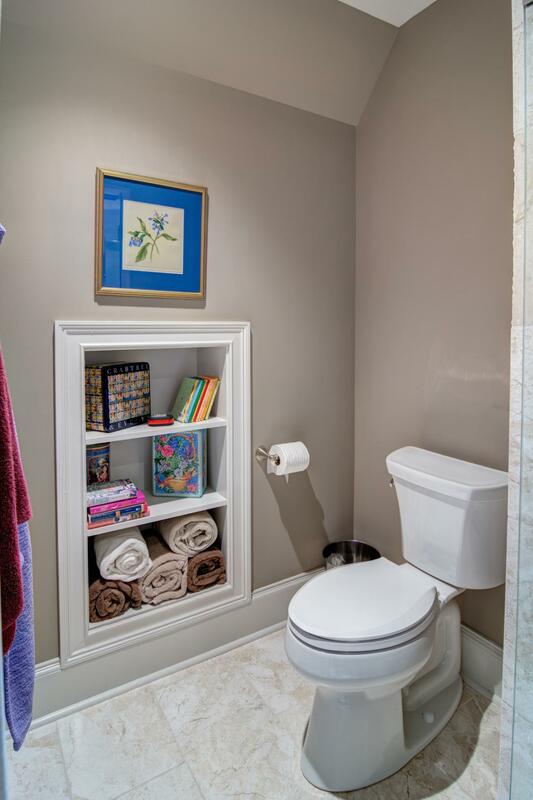 What place does a bookshelf have as far as bathroom storage ideas? Plenty, if you ask us. With a little manipulation, this small bookshelf has been transformed into a practical little storage nook. 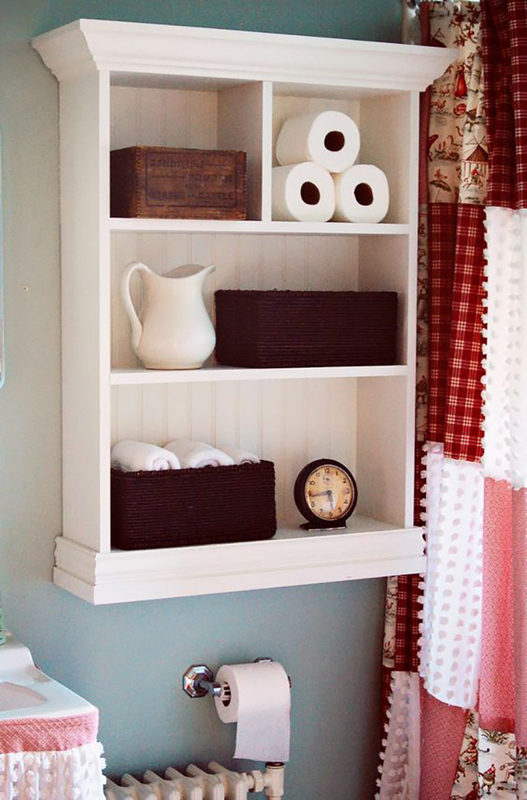 Both of the original shelves have been used, but a small divider on the top shelf turns it into an excellent little space for bottles, toilet paper or just some small knickknacks. The fact that the shelf matches the wall color and blends well with the drapery also makes it appear more natural in the room so that no one suspects that it truly is a bookshelf. This floating divided box is quite easy to replicate and its simple practicality is what makes it so clever. 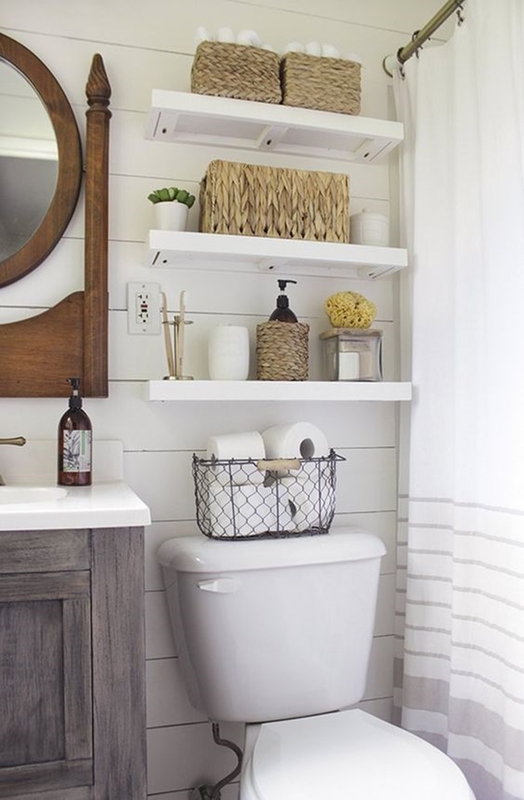 We love bathroom storage ideas like these that make you ask yourself, “Why didn’t I think of that?” It’s simple and inexpensive to build yourself if you can’t find your own and, paired with some small pots or jars, has a wide variety of practical uses. You can place lots of things in this shelf. Try putting your bathroom’s odds and ends in the boxes, buy small flower pots and put potted flowers in each box or put flameless candles inside. Looking like it just came out of an Ikea store is this lovely floating crate shelving unit. Crates this size are perfect for if you have a lot of something, like towels or bottles. A piece like this is also highly customizable, making it a snap to tailor to your own style as well as the space you have available to you. These shelves would also be great for displaying large flameless candles, battery-powered lights or even stained glass with lights behind it thanks to their depth. Just imagine seeing such a display in the dark during a relaxing bath. Normally you would associate a cubby hole with children’s shoes. Not in this case, though. This is one of the more unusual solutions we found, and we just love the uniqueness of it. Not only does this increase your design options, but it also gives you so much more room than a flat, blank wall ever would, without taking up much more space. For example, you can put this near your shower for storing shampoo and soap, near your toilet for storing toilet paper and other toiletries or near your bathtub for storing candles, oils and bath salts. 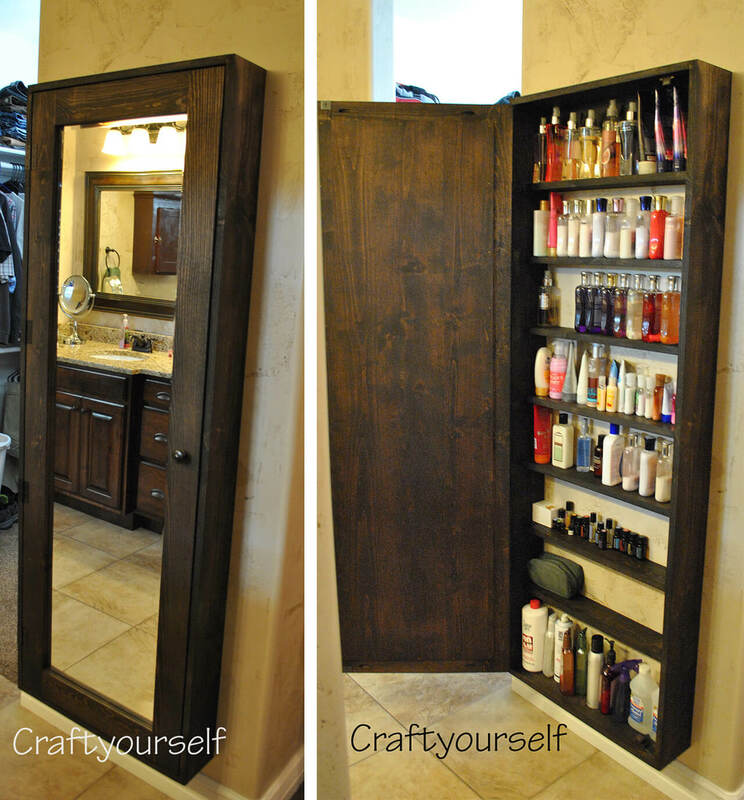 If you aren’t a fan of medicine cabinets, this one will make you think twice. 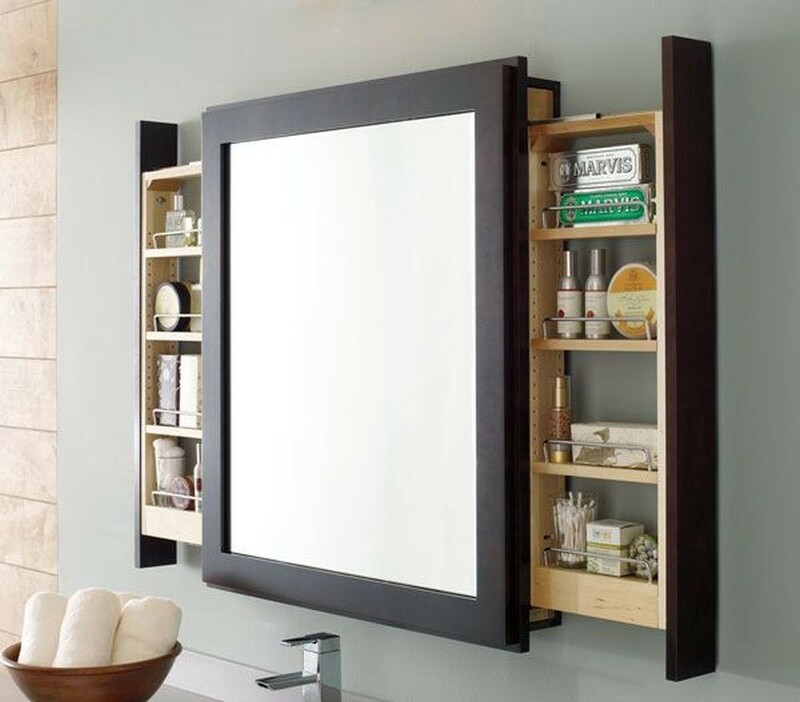 While it looks like something out of a science fiction movie with its secret revealed like this, this mirror eliminates the need for too much space. It has no door on it, making it almost flat against whatever wall you choose to put it on. It will also leave quite an impression on guests who may need something. Just imagine their shock when they see the mirror’s trick for themselves. This mirror in stainless steel would make a wonderful statement piece in a modern bathroom. In a similar vein to the bathroom storage idea we just mentioned above is this full-length mirror. This one reminded us of those jewelry mirrors you see on shopping channels from time to time, so to see a similar mirror used like this was delightfully surprising. 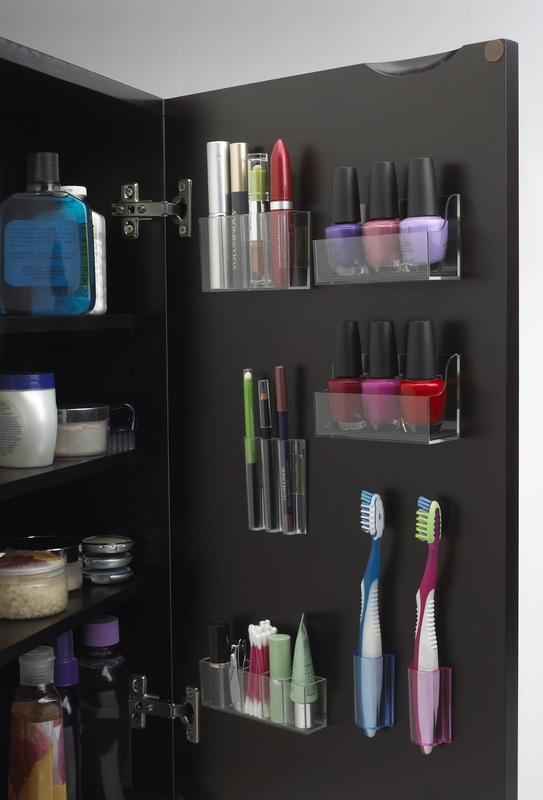 It’s the perfect place to store cleaning supplies, beauty supplies and other necessities. When the mirror is closed, it also makes itself useful by giving guests a larger mirror to use. It can also make the room look much larger than it really is. Its only flaw is that it can block things off. 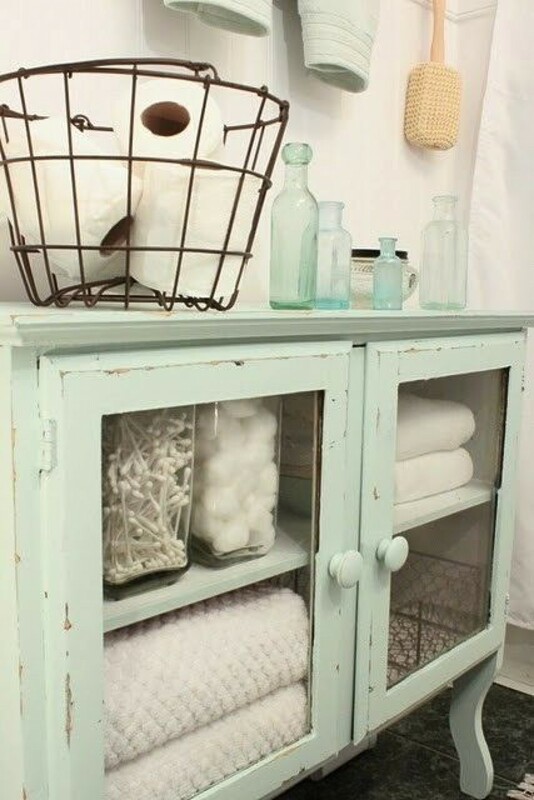 Another one of the most deceptively simple bathroom storage ideas we’ve seen is this set of large glass jars. 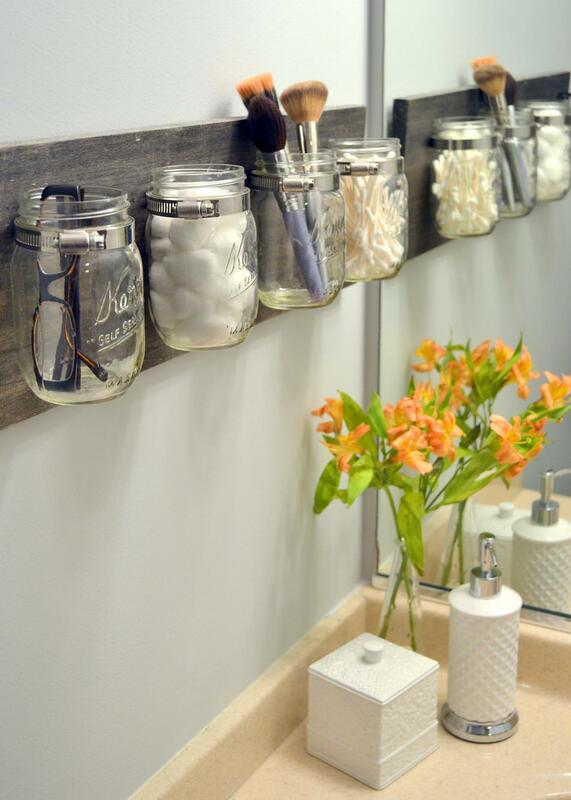 Although the mason jars we showed you are similar to this, simply placing these jars around the bathroom as décor has been executed quite well here. The large baskets beneath the jars help to complete the look of a seaside getaway. What makes the baskets interesting is not only their material, but also their contents. How else could you put toilet paper in plain view of your guests and have it look so attractive? We love simple ideas like this one. An a-frame shelf is already a flexible piece of furniture, but not many people would use it in their bathroom. Because of each individual shelf’s differing size, a shelf like this one can be used for both decoration and storage. You can put flowers or candles in the topmost shelf, then work your way gradually down to smaller items like soaps, towels and bins full of odds and ends. The topmost shelf would also be excellent for an incense holder to perfume your bathroom with, while towels and other cloth items absorb the scent while sitting on the lower shelves. This small metal basket is one of the most impeccable solutions we’ve seen for beauty products. The plastic bin inside makes it even better, putting your hair dryer, hair spray, hair brush and curling iron all in one place. Plus, it definitely beats digging it out of a hall closet and untangling cables. This simple bathroom storage hack is a great way to shave several minutes off of your morning routine. This can also make for a great grooming station for men as well; put anything the man in your life might need to look his best instead. Ah, the joy of thrift stores and garage sales. 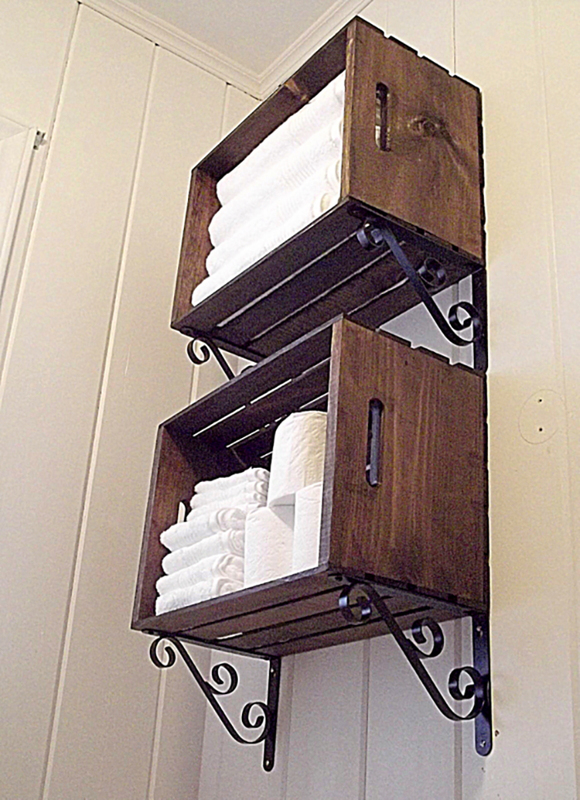 One of our more unorthodox bathroom storage ideas is demonstrated with this piece. A display case may not seem like the best piece of furniture to put in a bathroom since you’re trying to hide things most of the time. This piece works so well precisely because it’s unexpected; at the same time, you don’t realize what it is right away. A piece like this is wonderful for storing things in plain sight, while making it blend in with the rest of your décor keeps it from drawing attention to itself. Here’s a friendly reminder that great bathroom storage options don’t necessarily require you to go out and buy some big, fancy, new piece of furniture. A mix of materials, colors and textures can also make a bold design statement without costing you a fortune. If you notice, each shelf also has its own individual color scheme, making it easier to remember where everything is stored. 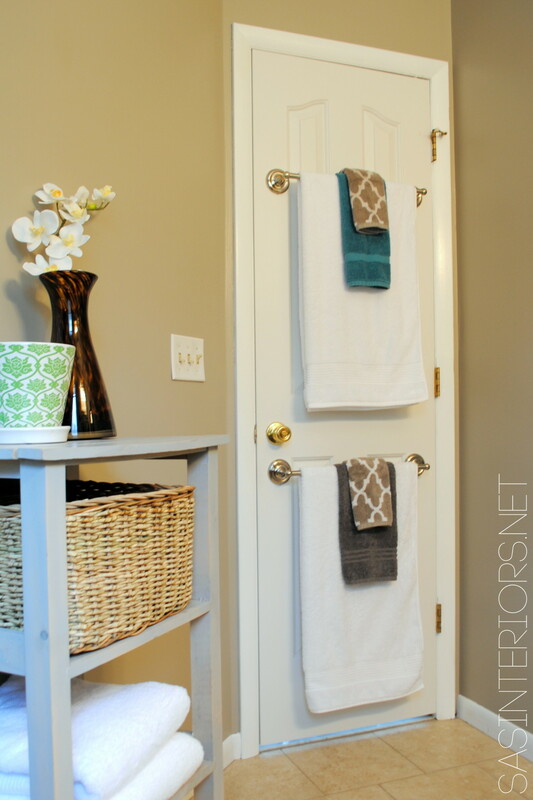 This little idea is so easy to adapt to your personal space, too. The key is to play around with different shapes, textures and colors until you find a combination that matches your personal taste. Here is an unorthodox idea: replace one of the drawers in your bathroom cabinetry with a keyboard drawer from a computer desk. The idea of a keyboard drawer is that it folds flat when it’s pulled out, making it into a sort of tray. Adding brackets, hooks and large cups to it like this would make it fantastic for wrangling cables when you’re done with your hair dryer or curling iron; just wait until they’re cold first. You could also attach small soap dishes for small odds and ends like toothpaste and toothbrushes so that they aren’t on your countertop. 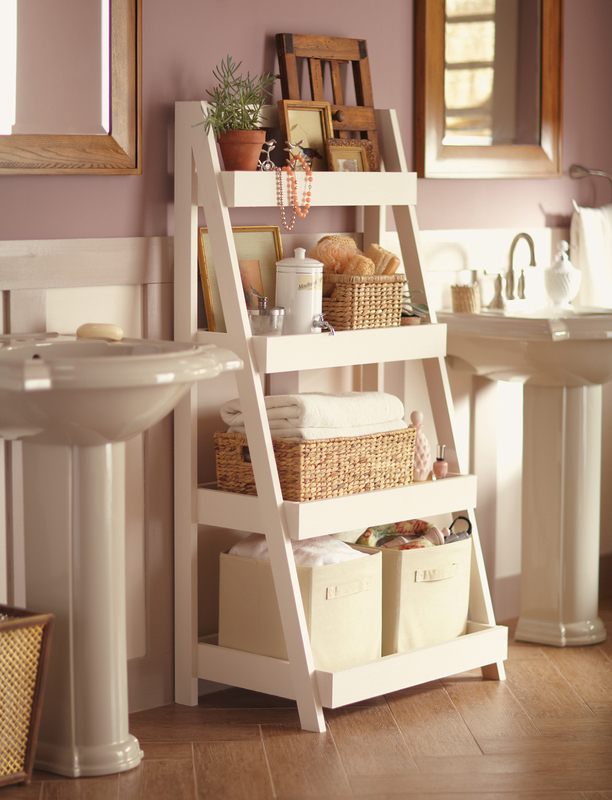 We already showed you bathroom storage like this one, so why are we showing you something so similar, you ask? Take a close look at what’s inside this particular closet: hanging from the door is a spice rack, and on one of the shelves is an old fashioned office inbox for storage. 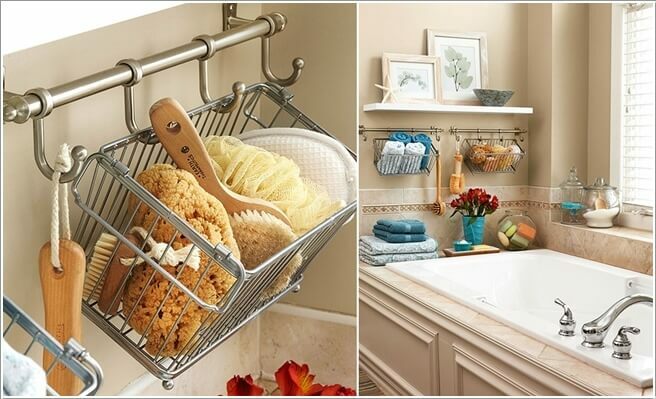 There are other great bathroom storage ideas packed in here as well. If you’ve noticed the hooks inside one of the shelves, then you have a sharp eye; those are for storing hair ties, headbands and other hair accessories without them getting tangled up in a drawer somewhere. If you’re not a fan of those oversized, bulky shelving units that go over your toilet, consider just using a few floating shelves instead. They take up much less space than those so-called “space savers,” which never meet expectations. They can also leave space above your toilet tank if you need to access it for any reason. It also gives you the freedom to put the shelves as high or low as you want. Just make sure the first shelf is high enough that no one will hit their head one of them if they need to use the facilities. Instead of putting extra storage on the wall, why not try putting it in the wall? Depending on where you decide to put it, the built-in shelves can serve a variety of decorative and practical purposes. You could try putting it near your bathtub for quick access to bath salts, magazines or essential oils. Putting it by the toilet like this avoids any unpleasant scenes if you happen to run out of toiletries. You could also put this on an accent wall to display ornaments and flowers to liven up the space. 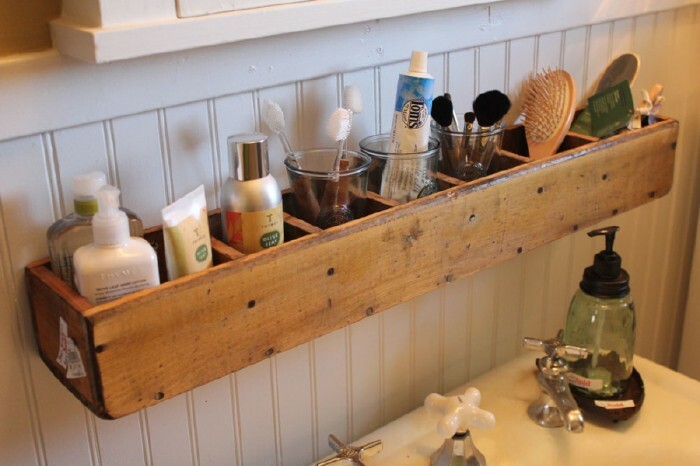 This clever bathroom storage hack has many possibilities. 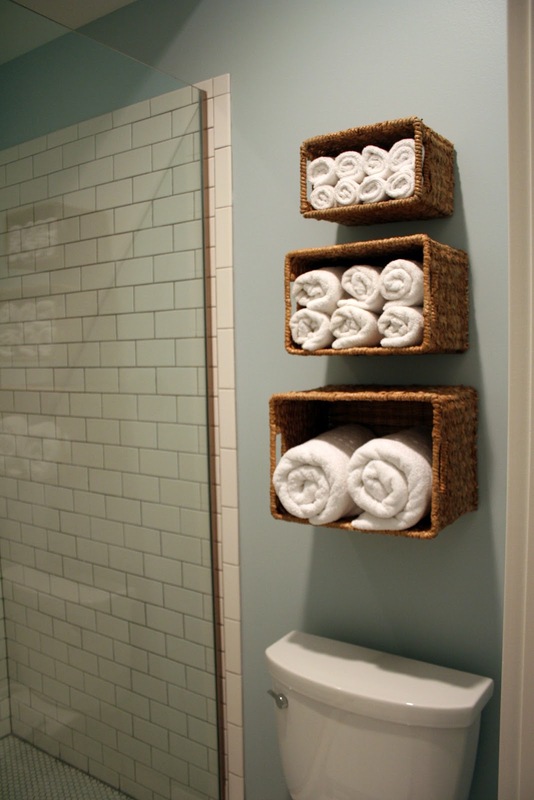 This is one of those bathroom storage ideas that is foolproof, inexpensive and perfect for any space. Step one: buy a towel rod, some shower curtain hooks and some hanging baskets. Step two: put the shower curtain hooks on the towel rod. Step three: Install the towel rod. Step four: hang the baskets and whatever else you want on the hooks. 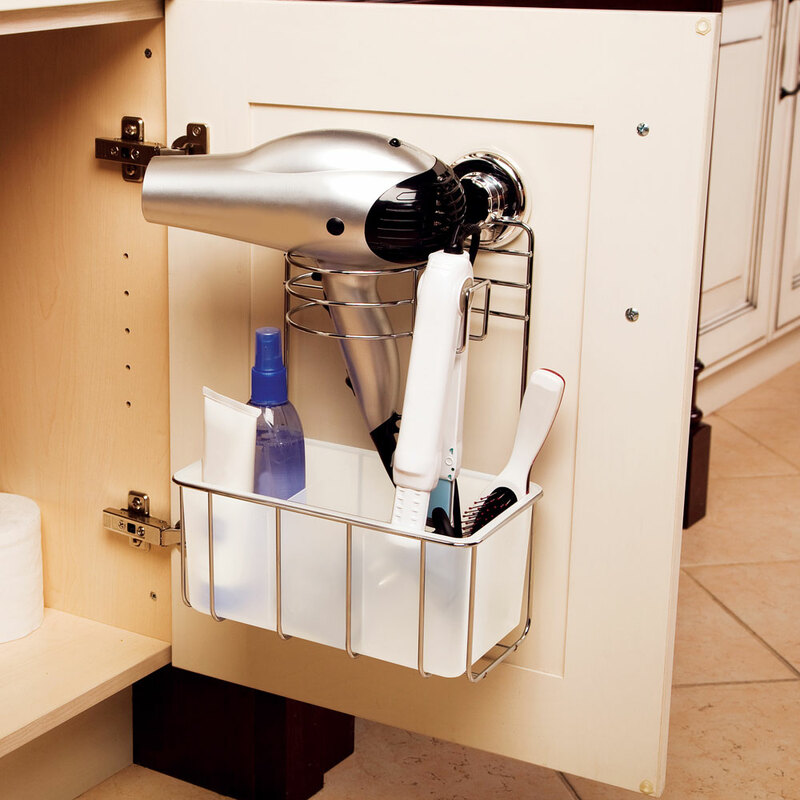 Just like that, you have the perfect storage solution for hair dryers, curling irons, loofahs, brushes and all sorts of other large bathroom items. Both the simplicity and the low cost make this idea more than worth a try. 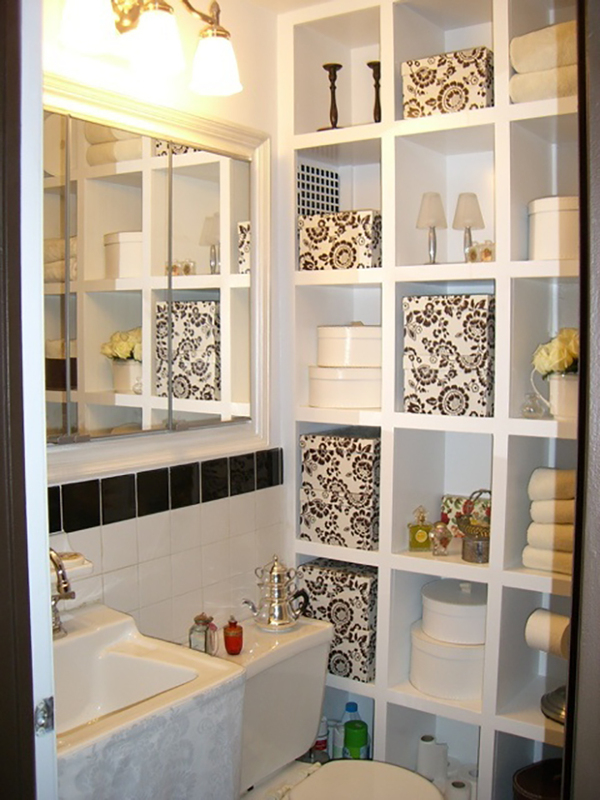 Here is another example of how to take advantage of built-in storage in your bathroom. If you don’t like boring old shelves, try a series of boxes instead. Making a storage shelf like this one is perfect for displaying just about anything you can think of, whether it be something practical, something decorative or both. It also keeps more delicate or potentially dangerous decorations out of children’s reach if you put it up high enough. Because of the height involved, we recommend trying out scented candles, incense or an oil burner to distribute a pleasant scent throughout your entire bathroom. 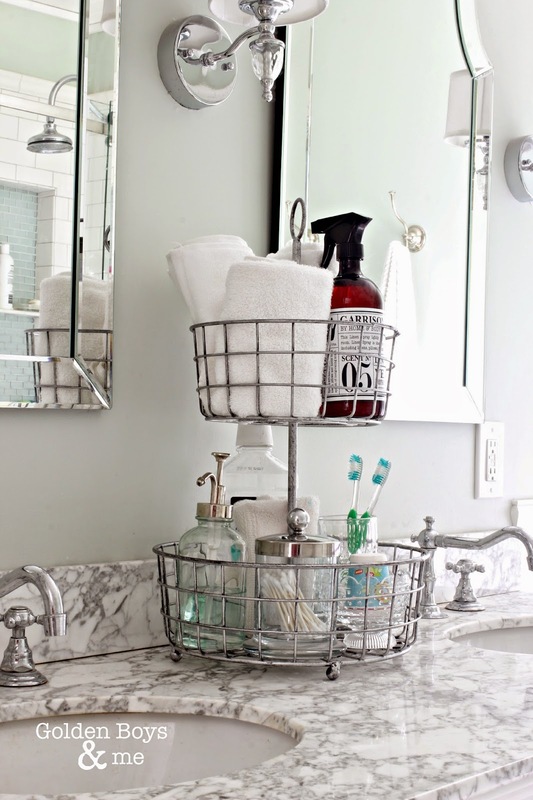 If you have a few storage baskets laying around and doing nothing, you’ll love this idea. 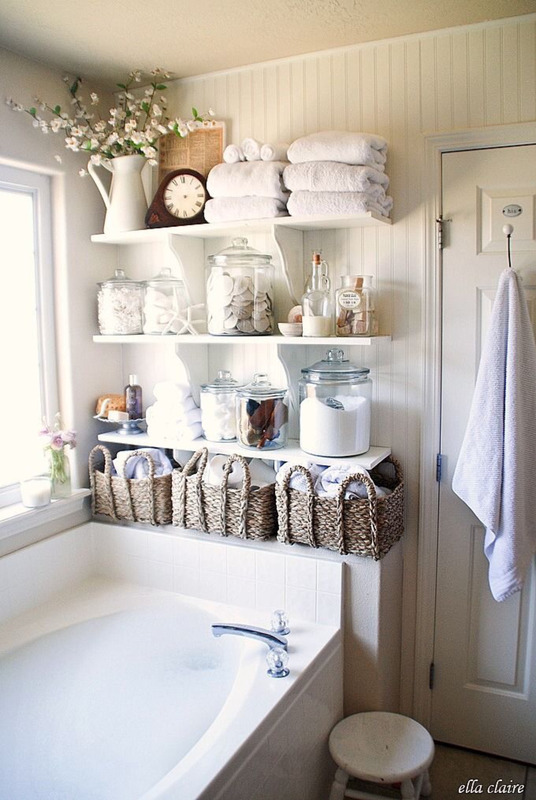 Mount a few small baskets on your bathroom wall and voila. You can group three similarly sized baskets together like this or go nuts and use an array of different types and sizes of baskets for a more eclectic look. We suggest wicker because it is a lightweight material, so there is little difficulty as far as installation. 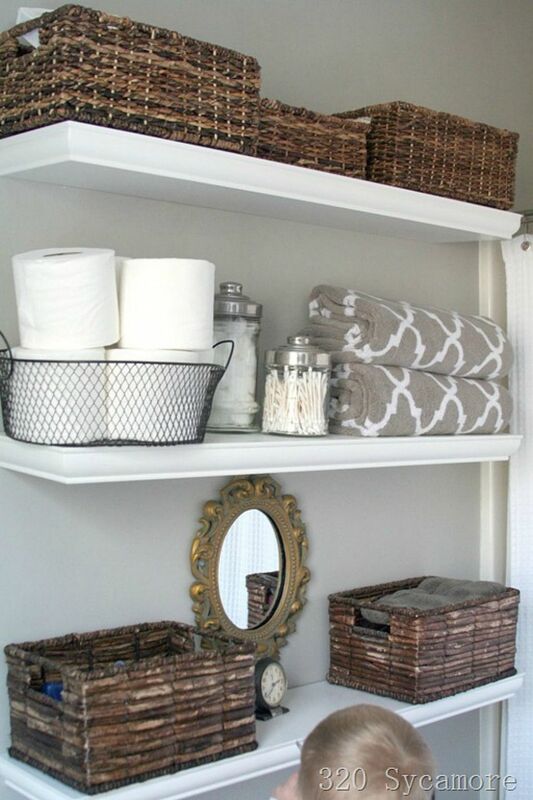 Some of our other bathroom storage ideas in this regard would include canvas baskets, woven baskets, wire baskets and even plastic pails for a child’s bathroom. Yes, you’re seeing this correctly; that’s a revolving spice rack. 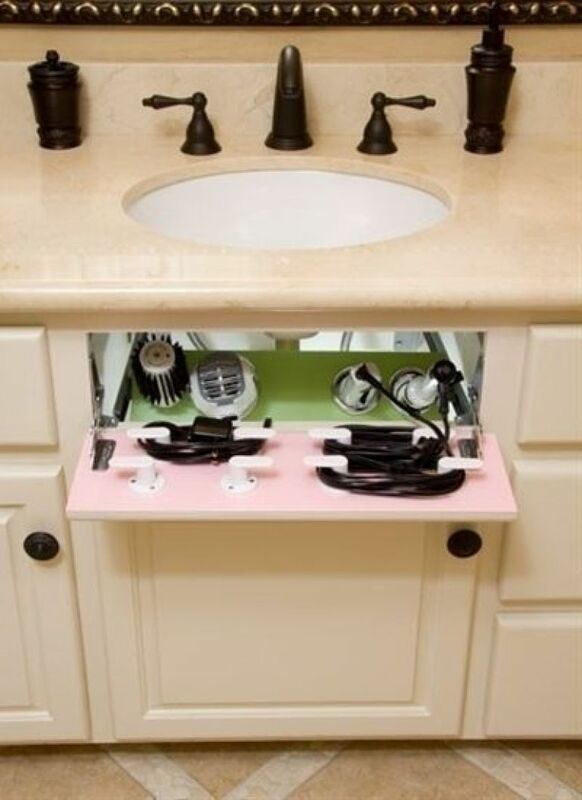 For bathrooms with two sinks, this is a brilliant little storage hack that can make a world of difference. Rather than dig through a cabinet for what you need, just put them on the spice rack and turn it to what you need, when you need it. The base of this particular spice rack doesn’t turn, but what’s to stop you from using one that does? This is one of those ideas that just makes your daily beauty routine so much easier by putting everything at your fingertips. 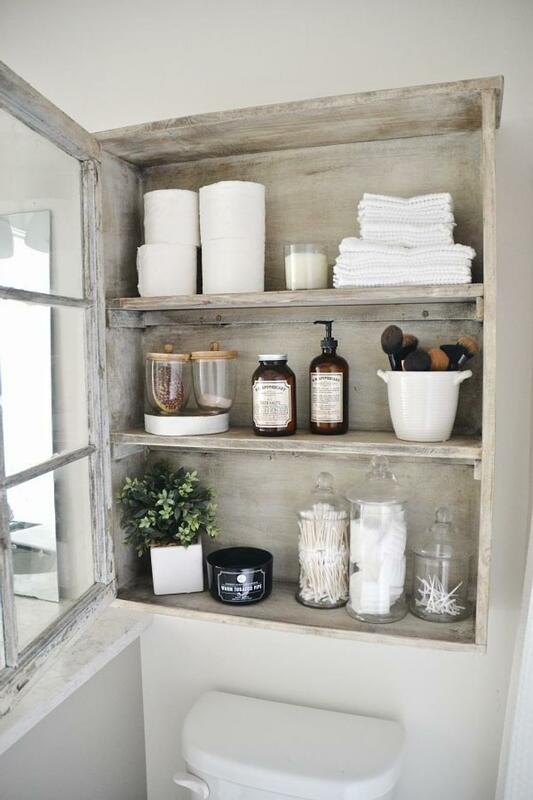 We hope you have enjoyed our list of unique bathroom storage ideas. From revolving spice racks to mason jars, this article just goes to show that you can use just about anything as a storage solution with some creativity and know-how. You don’t necessarily need to go out and buy some fancy new piece of furniture, either; many of these clever storage hacks are cost-effective as well as stylish. Take advantage of what is available to you, whether it be a budget, space or crafting know-how. You’re bound to come up with plenty of your own storage ideas as well.